The Okinawa Human Rights Association, formed for the protection of human rights for people in Okinawa under the U.S. military administration, and for education about and encouragement of awareness of civil liberties, marked the 50th anniversary of its establishment. Despite coming under the “Peace Constitution,” which extols respect for basic human rights and the renunciation of war, since its reversion to Japanese sovereignty Okinawa has seen an endless stream of incidents and accidents related to the U.S. military bases. The Japanese government is pressing forward with the transfer plan to Henoko, ignoring criticism from the Okinawan people, who call for the relocation out of the prefecture of facilities now located Futenma Air Station. The Fight for human rights continues in Okinawa. Before its reversion to Japan, Okinawa witnessed many U.S. military personnel who were either not charged despite committing violent crimes, and or were found not-guilty in military courts. In the days when Okinawan people required a passport to travel outside the prefecture, many who were judged by the U.S. military administration to be “undesirable” were not granted passports. “Neither the Japanese Constitution nor the American Constitution apply to Okinawa. Okinawa has been put to the side. Through the years Okinawan people have cried themselves to sleep over human rights abuses they have experienced. It is a wasteland in terms of human rights issues,” said Fukuchi. Fukuchi, who had a travel ban placed on him and was subjected to interrogation by the U.S. Counter Intelligence Corps, felt the need for the citizens to stand up and fight back. 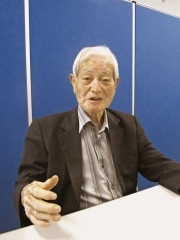 In April 1961, when he was working for the Okinawa Teachers’ Association, which played a central role in the reversion movement, he appealed to the chief editor of Ryukyu Shimpo, Okinawa Times, attorneys and legislative authorities to come together to form the Okinawa Human Rights Association. As soon as the Association was formed it received many cases to consider, among them those related to matters such as U.S. military personnel abandoning their wives and children, abuse of police powers, trafficking of female employees, and women falling victim to sexual assaults.